← The Barefoot Accountant wishes you a very Happy Easter! Please enjoy Bing Crosby singing “Easter Parade” from the 1942 film, “Holiday Inn”. Donald Trump says he’ll be happy to throw open the files on all his financial dealings and says even in bankruptcy he was proving just how smart he actually is. Isikoff: Wait a second. You were Chairman of the Board. You were Chairman of the Board. Trump: I was Chairman but I didn’t run the company. Isikoff: You were paid $2 million a year. Trump: Excuse me. I didn’t run the company. I’m just telling you. Isikoff: Why were you paid $2 million a year? Trump: Excuse me, because of my genius. Alex Burns is deputy political editor for Politico. In just a few weeks, Trump is headed to New Hampshire. From New York City new reports that could hurt his chances show billionaire Trump did not vote for the primary elections for two decades. How much might that hurt him? This is something that we’ve seen with billionaire candidates before. Meg Whitman when she ran for governor of California last year, turned out she really had not voted in decades. It was used against her to make the case that this is not a person who is serious about politics. This is an amateur billionaire who is doing something fun. I think that that could maybe hurt Donald Trump but I don’t think it will be a surprise to anyone that this guy is not a conventional politician and doesn’t engage in politics the way the other members of the Republican presidential field have. You know, listen, running for president, let’s take just the state of Iowa. There are republicans there according to a new AP report which question whether or not Trump would attend the small meetings and fairs and those events that are critical to win over that key primary state. What’s the read on that? That’s maybe the biggest test for Trump specifically in the next couple weeks as you mentioned he’s going up to New Hampshire where he’s supposedly going to do a walk and talk event somewhere in the state. It will be the first time we’ve actually seen him interact with voters in a retail politics way. In those early presidential states, that’s what really gets you where you need to go in terms of building support and so far we haven’t seen trump do anything of the kind. 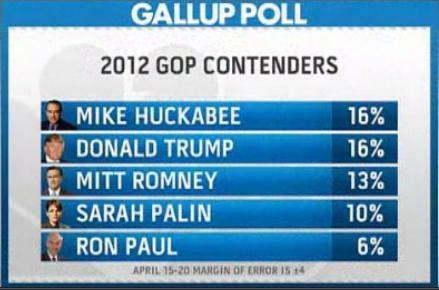 Okay, how about the new poll Gallup poll which shows Huckabee at the top of the race with Trump. I think the poll that you just mentioned, that has to be concerning for some republicans that top two candidates, Huckabee and Trump, are media personalities who are flirting with the race but haven’t indicated that they are serious about running. There’s a desire for new candidates. Faces that aren’t out there campaigning already. Okay, but let’s talk about the populous perspective. The message is resonating with voters out there. One poll shows 70% believe the country is going in the wrong direction. Do you think his voice if it is a populist one has, some sort of staying power in this economic environment? Whether or not Trump is the right person to deliver that message, I think there clearly is a strong desire among republican primary voters in particular for someone to go out and say what Trump is saying that America is on the decline. We can’t trust Barack Obama to stick up for us on the national stage. The way Trump says it is the U.S. is now the laughing stock of the world. He’s clearly gained a lot of traction. He’s had a big microphone to deliver that message and if another candidate can hit the same coward in the same confrontational way, they might go farther than pretty flawed guy like Trump. Okay. Alex Burns, thank you. This entry was posted in Accountants CPA Hartford, Articles and tagged Is Donald Trump running for President?, MSNBC TV April 23 2011, Politico's Alex Burns, Trump tops Gallup poll GOP presidential candidates 2012, Trump tops GOP candidates in latest Gallup poll, Trump's chances. Bookmark the permalink.